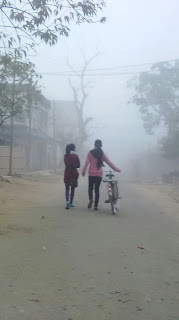 SILCHAR, Jan 11: Cold wave continues to batter the normal life in all threedistricts of Barak Valley asit today witnessed another chilly day which has sent the shivers downthe spine. In fact, normal life across the valley has been badly affected. As dusk begins and night advances, roads and streets become deserted with few vehicles and pedestrians on the move. It has been an unprecedented cold weather according to the elderly citizens it has never happened in the last 30 years. Unless and otherwise on urgent assignments or works, people preferred to stay indoors. Many were seen warming themselves before bonfires after the dusk in all the parts of thevalley. According to Metrological Department, in Cachar, the maximum temperature today was recorded at 13 degree Celsius and the minimum temperature was 5 degree Celsius. In Karimganj, maximum temparature was recorded at 15 degree Celsius and minimum wasat 6 degree. In Hailakandi,the maximum was at 14 degree Celsius and minimum temperature was recorded at 6 degree Celsius.